This page is divided into three sections; each section is in alphabetical order.
. Gyms for 2007 AAU tournaments. The most current gyms are preceded by "0AAU" to sort them to the top. Other AAU Gyms are preceded by "1AAU".
. Non-Arlington gyms. The top section includes gym locations outside Arlington County that Matrix teams play at. These names of these gyms are preceded by "1FC".
. Arlington gyms. The second section lists gyms in Arlington County that are frequently used for Matrix practices, clinics, etc. This entry is for the Main Gym at Swanson. Swanson Middle School is located at the corner of N. Washington Blvd. and N. Patrick Henry. The main gym is the larger gym located closest to N. Patrick Henry.
. Turn left at light on N. 16th St.
. Go .5 miles; the church is the big driveway on the right after you pass Harrison St.
. About 1 mile into Arlington , turn right on Williamsburg Blvd.
. About .5 miles, turn left on Harrison St .
. Stay on Harrison , crossing Yorktown Blvd and Lee Hwy until you get to N. 16th St .
. Turn right on 16th St .
. The church is the driveway into a parking lot after about 100 yards. Park in the upper lot; enter the door closest to the lot. Go up the stairs and the gym is there. Proceed to Route 1 southbound out of Alexandria. From Alexandria, proceed southbound on Route 1 for approximately 2 miles after you cross the Beltway. Turn left at the light on Popkins Lane. The school/community center is just ahead on your right. Take I-66 west and exit onto Route 267, Dulles Toll Road. Go about 13 miles on Route 267, exiting at Exit 10, Centerville Road (Route 657), by Worldgate Plaze. Turn left on Centerville Road (Route 657). Go about 3 miles and then turn right on McLearen Road; school will be directly on your right. West on I-66, taking Route 28, southbound. Turn left on New Braddock, right on Union Mill Road. The School just ahead on the left. West on I-66. Exit Route 50 Westbound at Fair Oaks. Follow Route 50. Go approximately 3 miles and turn left on Majestic Lane. Go .4 miles and turn left on Poplar Tree Road. Go .7 miles and turn on Stringfellow Road. Go .5 miles and arrive at school. From Arlington. Proceed westbound on Old Dominion Drive. Go through McLean and turn right on Balls Hill Road, approximately 1 mile after you cross Route 123 in McLean. School is .8 miles ahead on Balls Hill Road. From inner loop of Beltway. Take Exit 44, Georgetown Pike exit. Turn right at light at the end of the offramp onto Georgetown Pike. Turn right at next light in .1 miles. As soon as you turn, the school is on your left. From George Mason, go west on Route 50, Arlington Blvd, for 9.1 miles. Turn right on Fairfax Circle. Go .1 miles and turn right on Old Lee Hwy. Go 1.4 miles and the school is on your left. All teams park in the far left parking lot. The school in front of St Leo’s Church and School. There are two entrances to the school. The gym entrance is at the far left of the school (facing the front). All teams enter the gym from the rear of the left parking lot looking at the ball field. You will walk pass the ball field. From Arlington. From any location in Arlington, get to I-395 and go south on I-395. Take Exit 3A (VA-236 East) onto Duke St. toward Landmark Mall. Go .5 miles and turn right on S. Van Doren St. Go 2.3 miles on Van Doren St. and turn left on Franconia Road. Edison will be on your right as soon as you complete the turn onto Franconia. As you turn into the school, go right and the entrance to both gyms is at the end of the parking lot. From Beltway. Take Exit 3, Van Dorn St. exit off the Beltway (I-95). Proceed to light and turn right onto Van Dorn. Go approximately .5 miles and turn left on Franconia Road. School is on right just as you turn. Turn into first driveway and take right into gated area. Gym is to your left as you enter the parking lot. Gym #1 is large gym as you enter doors; Gym #2 is behind Gym #1. West on I-66. Exit on Nutley, southbound. Turn right on Lee Highway. Stay straight across Route 50 and road turns into Old Lee Hwy. Go .6 miles and school is on right. Proceed west on Route 50, Arlington Blvd. from Arlington. About 2.5 miles past 7 Corners, turn left at the light oto Jaguar Trail. The school is straight ahead. Enter the gym from parking lot between the school and the fields. West on I-66 to I-495 Beltway South. Go approximately 3 miles and exit westbound on Little River Turnpike. Proceed on Little River Turnpike for 2.7 miles and then turn left on Pickett Road. Alternatives to avoid freeways. Take Route 50 West to Pickett Road which is just before Fairfax Circle. Turn left on Pickett Road and stay on Pickett. Frost Middle school will be on your right on Pickett approximately .5 miles after you go cross Little River Turnpike. Another alternative is to take Columbia Pike west out of Arlington. Once Columbia Pike intersects Little River Turnpike in Annandale, turn right on Little River Turnpike and follow the directions above to the school. Proceed west on Columbia Pike. Turn left on Fairfax Parkway, about 1 mile past Route 7 (Bailey's Crossroads). The school is .6 miles ahead on your left. From the Beltway take the I-95 exit southbound or from southbound I-395, go past Beltway to I-95. Follow the ramps to exit on the Franconia-Springfield Parkway. From I-95, exit to VA-644 toward Franconia Road. Right after Springfield Mall, turn right on Frontier Drive and go .6 miles. Take ramp onto Franconia-Springfield Parkway and to .9 miles. At Beulah Road, the road changes names to Manchester Blvd. .3 miles after crossing Beulah Road, turn right onto Hayfield Road. Go 1.0 miles and turn right onto Telegraph Road. The school is .1 miles ahead. Go West on Columbia Pike out of Arlington. Approximately 1.5 miles after you pass Route 7, turn left on Braddock Road. Go 1.7 miles and turn left on Montrose St. The School should be on your right after .2 miles. West on Route 50, exiting northbound on Gallows Road. Turn right on Gallows Road. Proceed through stop light and school is immediately on left. General location. Just north of the intersection of Gallows Road and Route 50; in between Lee Highway and Route 50 on Gallows Road. Proceed west on Columbia Pike. Approximately 1.75 miles past Route 7, turn left onto Braddock Road. Go about 2.3 miles down Braddock Road to the school. Take I-66 westbound, exiting to Route 7, Leesburg Pike, westbound. Immediately cross all lanes of traffic (this is tricky) and turn left at light at Idylwood. Follow Idylwood for about 2 miles and turn right at the light on Gallows Road. Go about 1/2 mile and turn left on Wolftrap Road and school is right there on the right. North on Glebe Road, following signs to Chain Bridge. Turn left on Chain Bridge Road at light just before getting to bridge. Follow Chain Bridge Road for 2 miles, taking right at light on Old Georgetown Road. School is on right in just less than a mile. via I-395. From any location in Arlington, get to I-395 and go south on I-395. Follow I-395 until you pass the Beltway and the freeway turns into I-95. See exit directions below as soon as you pass the Beltway. via Beltway. Take I-66 West to the Beltway and exit South I-495 on the Beltway towards Richmond. Stay on I-495 for 7.3 miles and exit southbound onto I-95 towards Richmond. Exiting I-95 in Springfield. Take the Eastbound exit for Franconia Road 1 mile south of the Beltway. As soon you loop around and start Eastbound on Franconia, stay right and and take the access road by Springfield Mall that runs parallel to Franconia Road. Turn left at Frontier Drive. Go about 3-4 blocks and turn right on Cimarron St. and school is directly in front of you. The entrance to the gym is at the end of the school as you look to your right once you enter the parking lot. West on I-66, taking Route 28, southbound. Turn left on New Braddock, right on Union Mill Road. The School will be approximately 2 miles on left. From Glebe Road, proceed west on Washington Blvd to where it intersects Lee Highway by the Exxon station. Go straight through light, past onramp to I-66. Go straight/right at stop sign and you're on Westmoreland. Continue on Westmoreland, through the light on Williamsburg Blvd. Go about 1+ miles and the school is on your left at the corner of Westmoreland and Kirby Road. You enter the both gyms from the hallway on the right side of the school as you look at the school from the parking lot. West on I-66, exit westbound on Route 7. Go about 1 mile and school is on left. Proceed to Old Dominion Highway, westbound to McLean. Take Old Dominion all the way into McLean and turn left on Chain Bridge Road. To Main Gym. From the turn onto Chain Bridge Road, go .6 miles and turn left on Westmoreland St. Go .2 miles and turn right into driveway entrance to McLean High School. The entrance to the main gym is at the end of the building. To Auxiliary Gym. From the turn onto Chain Bridge Road, go .8 miles and turn left on Davidson Road. Go .2 miles and the school is on your left. The school's main entrance is there and the Auxiliary Gym is just down the hall on the left. Note: You can access either gym from either entrance; you just have to walk further up the hall. Go west on Wilson Blvd. toward 7 Corners. At top of hill just past Upton Hill Park, turn left on John Marshall. Turn left on Willston which immediately turns into Patrick Henry. Stay on Patrick Henry through Rt 50 light and through Route 7 traffic light. Turn left on Diamond Drive about .75 miles after you pass Rt. 7. Go right on Peace Valley Lane and school is ahead. Go west on Lee Highway, Rt 29. About 1.5 miles after you cross the Beltway, turn right on Cedar Lane, Rt 698. Go about .7 miles and school is on the left. Rough location: Across Beltway from Cameron Run in Alexandria; Northeast of Edison High School on Franconia Road. Sample directions. Go to Shirlington/I-395. Cross I-395 and go up hill on Quaker Lane. Go 2.1 miles and turn left on Duke St. Go .7 miles and continue on ramp for .2 miles. Take Telegraph Road for 1.1 miles and turn right on Franconia Road. Go 1.7 miles to Twain MS. Via the GW Parkway. From the GW Parkway, proceed through Alexandria and turn right at Belle View Blvd. Follow Belle View Blvd. for 1.0 miles (the road angles left after you cross Ft. Hunt Road). Turn Right on Quander Road; West Potomac HS is .3 miles ahead on your left. Via Route 1. Proceed from Arlington to southbound Route 1 through Alexandria. Approximately 2 miles after crossing the Beltway (I-495) on Route 1, turn left on to Quander Road. The school is .6 miles ahead. Go westbound on Route 50 (Arlington Blvd.). Go approximately 6 miles past 7-Corners and turn left on Pickett Road. Go 1.7 miles on Picket Road and turn right on Main Street in Fairfax and W.T. Woodson High School is just ahead. 1. Go northbound on I-395 across Potomac River; follow I-395 by staying right when road forks after crossing the bridge. 6. Road turns into 20th St. NE at traffic light at Evarts Rd. Stay straight/angle slightly right at the light. 7. Gym is just ahead on the right. Once you enter the community center, the gym is downstairs. 1. Exit the Beltway left onto I-270 and go 2.8 miles and exit on Montrose Road. 4. Go .5 miles on Randolph Road at arrive at Montrose Christian School on your right. The main entrance to the gym is on the east side of the school. 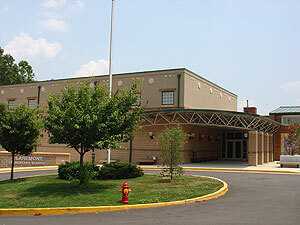 Northwestn HS is located in PG County, very close to the University of MD. 1. Northbound across 14th St. Bridge (I-395). Stay on main freeway route; it becomes I-295. 2. Follow I-295 approximately 2 miles to Pennsylvania Avenue exit. At end of off ramp, turn right and take Souza Bridge across the Anacostia River. 3. As soon as you cross the bridge, turn left at the first light and take Route 295 Northbound. 6. Go West on Riverdale Rd for appoximately 3 miles and turn right on Adelphi Road (about .5 miles after crossing Rt 1). 7. Go about .75 miles and the school is on your left. 1. Go North on outer loop of the Beltway across the Wilson Bridge. 2. Take the I-295 exit Northbound. 5. Go West on Riverdale Rd for appoximately 3 miles and turn right on Adelphi Road (about .5 miles after crossing Rt 1). 6. Go about .75 miles and the school is on your left. 5. Turn Left on South Dakota – go 1.1 mi. 6. Turn left on Perry St. – go .1 miles and school is on left (corner of 18th and Perry. 3. Follow Pennsylvania Avenue for approximately 4 miles. Turn left on Silver Hill Road and go .5 miles. 4. Turn right on Marlboro Pike; the is facility in .4 miles. Entrance is just past Pep boys and before you get to Giant. Facility is at back of parking lot. 2. Go about three miles on Route 118 (Germantown Road) - best to stay in center lane to minimize lane changes as road narrows. 4. Go 0.6 miles to stop sign and turn left onto Schaeffer Road. 5. Go 0.6 miles to traffic circle, enter circle, and go right onto Central Park Circle. Go to Alexandria to Route 1. From the intersection of the Beltway and Route 1, go south on Route 1 for about 5 miles. Turn left at the light on VA Route 235. In 1/2 mile, bear right onto Old Mt. Vernon Road. The school is on the left in 1/2 mile. Go past the main part of the school and turn left just before the fields. The entrance to the gyms is in the back of the school. From Route 50 and S. George Mason Drive. Go south on George Mason for approximately 1.5 miles. Turn left at light on Four Mile Run Drive. Sports Center is on right at first traffic light. Claremont Elmentary School is located right behind Wakefield High School. From Route 50 and George Mason Drive. Proceed southbound on George Mason and through the light on S. Four Mile Run Drive. Go .25 miles and turn left at light on S. Columbus St. Proceed up hill and follow road around to the right. The school is on the left right after you turn the corner. Take Wilson Blvd. west to the intersection at 7 Corners. Follow signs to go east on Route 7/Leesburg Pike. Stay right as you make the turn onto Route 7. As soon as you pass the last light in the 7 Corners intersection, immediately take the right turn onto Sleepy Hollow Road. Go 1.1 miles and the school is on your left. As you come up the drive way of the school, the first building on the right is the gym. From N. Glebe Road, turn west at the traffic light on 18th Street N. The school will be straight in front of you as you make the turn. Enter through the main doors at the front of the school and the gym entrance is immediately to your right. North on Glebe Road. Turn right onto Lee Highway. Go about 1/2 mile and turn left on Lorcom Lane. Go about 1/4 mile and turn right on 23rd St. N.; go about one block and turn right into driveway just as road turns to the left. Entrance to the gym is on the west end of the school by the small baseball diamond and the tennis courts. Westbound on Route 50, taking the Carlin Springs Road exit. Turn left on Carlin Springs, go under Route 50 and school is on your right. Eastbound on Route 50, taking the Carlin Springs Road exit. Turn right on Carlin Springs, and school is on your right. Once on Carling Springs Road. Go to driveway at far end of school and park in the back lot. Gym is toward back of school, the left side of the building as you look at the school. Swanson Middle School is located at the corner of N. Washington Blvd. and N. Patrick Henry. The auxiliary gym is the smaller gym located closest to Washington Blvd. From Rt 50 and George Mason, proceed south on S. George Mason, through the light on Four Mile Run Road. Take a left at the light on Dinwiddie St. and the school is directly on your left. The Main Gym is immediately to your left as you enter the main doors.